Normal to below normal rainfall was experienced for the month in the islands of the eastern Caribbean. 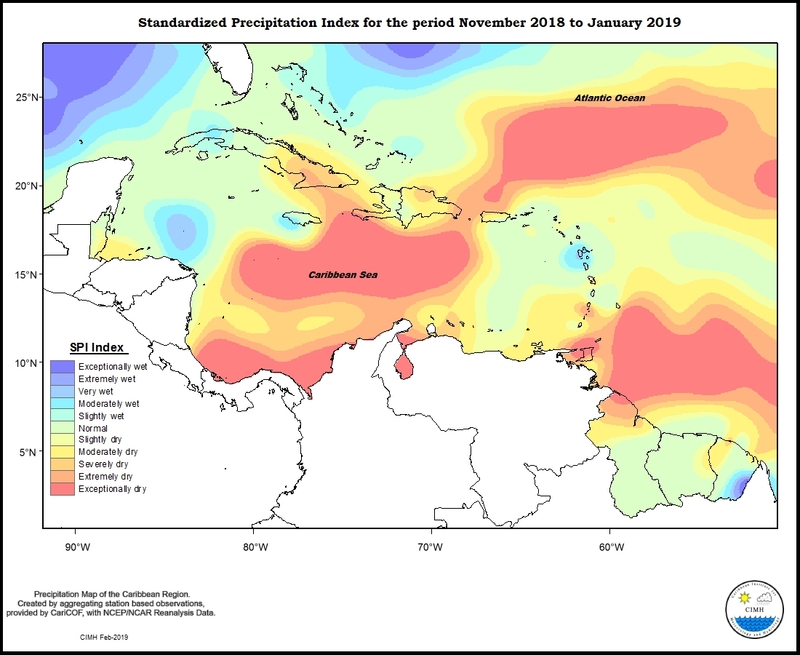 Trinidad, Barbados and Dominica were normal to moderately dry; Grenada, St. Lucia and Antigua were slight to moderately dry; Tobago normal to slightly dry; St Vincent severe to extremely dry; Martinique moderate to extremely dry; Guadeloupe, St. Kitts, St. Croix and St. Thomas normal; and St. Maarten moderately dry. 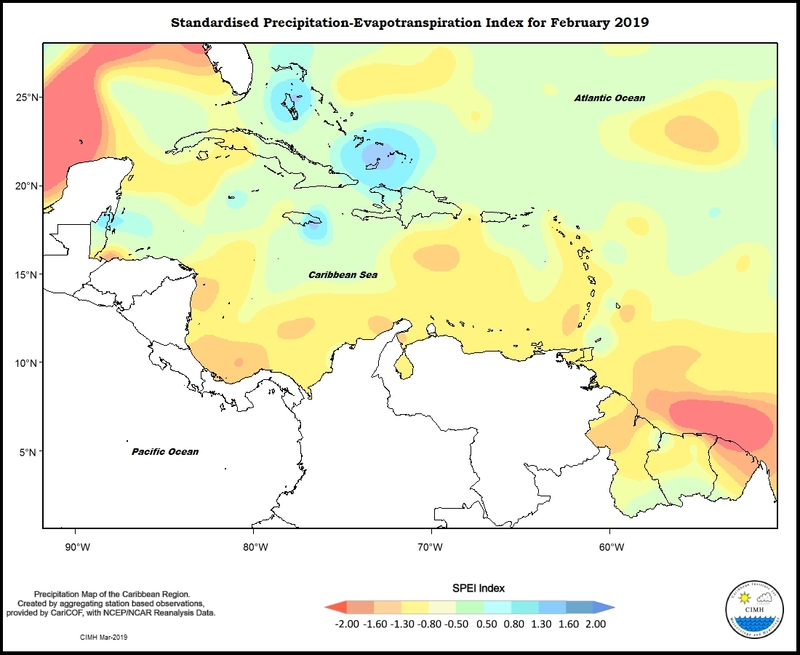 Conditions in the Guianas ranged from exceptionally dry in central French Guiana to normal from the eastern half of Guyana across to central Suriname. 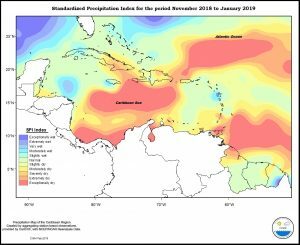 Aruba and Curacao were moderately dry. 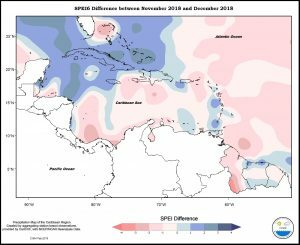 Both Puerto Rico and Hispaniola were predominantly normal, apart from western Puerto Rico that was slight to moderately dry, southern Hispaniola that was slight to moderately dry and eastern Hispaniola that was slight to exceptionally dry. 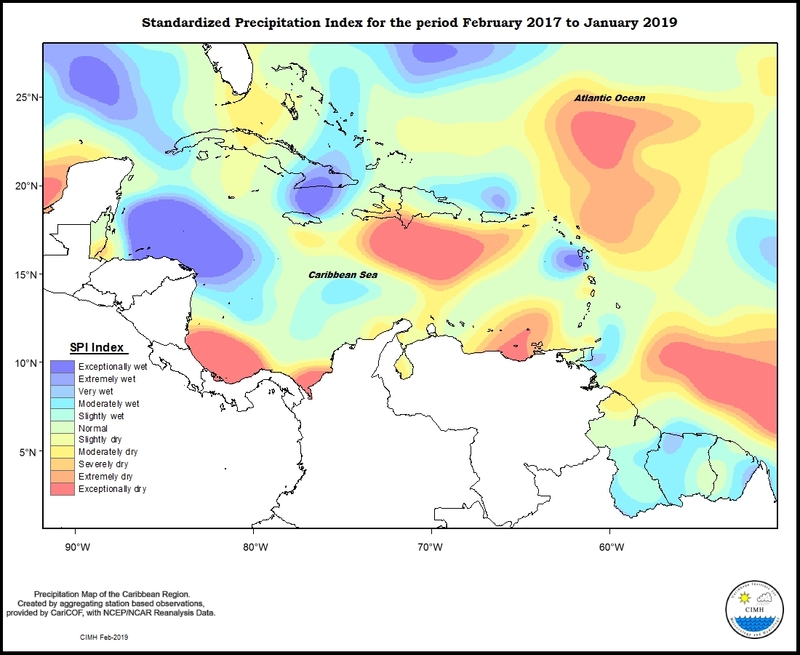 Conditions in Jamaica ranged from slightly dry in the north to moderately wet in the east, while Grand Cayman was slightly wet. Rainfall in Cuba was predominantly normal apart from central areas that were slight to moderately wet and the extreme northwest that was slightly dry, but northern Bahamas was slight to very wet. 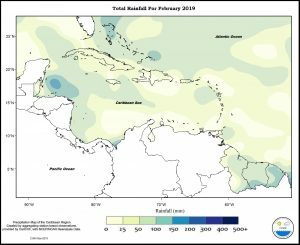 Conditions in Belize ranged from moderately wet in the north to moderately dry in eastern and central areas. 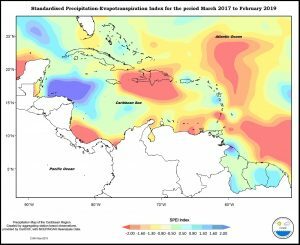 For the three month period, normal to below normal rainfall prevailed in the islands of the eastern Caribbean. 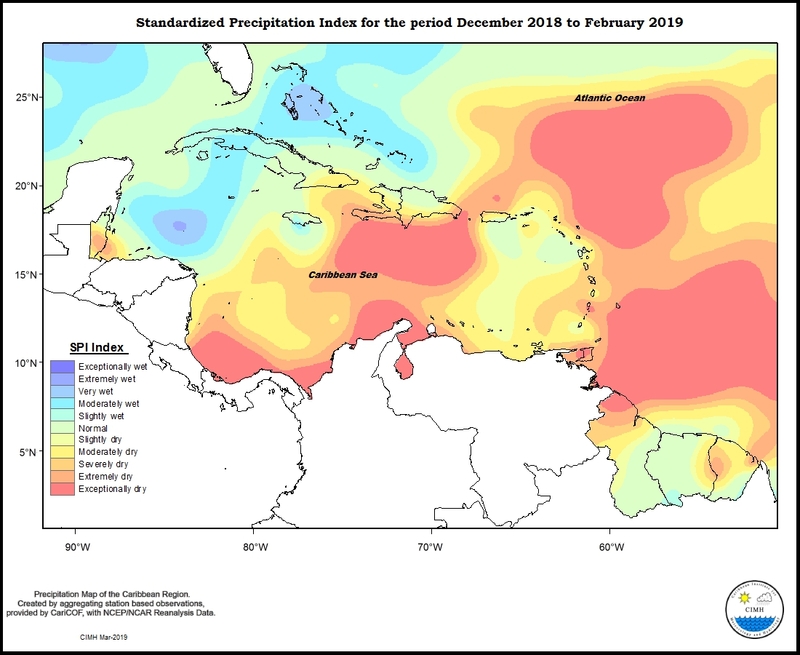 Trinidad, Barbados and St. Vincent were extreme to exceptionally dry; Tobago severe to extremely dry; Grenada slight to moderately dry; St. Lucia, St. Maarten and St. Croix moderately dry; Martinique severely dry; Dominica and Antigua moderate to severely dry; Guadeloupe normal to moderately dry; and St. Kitts slightly dry. 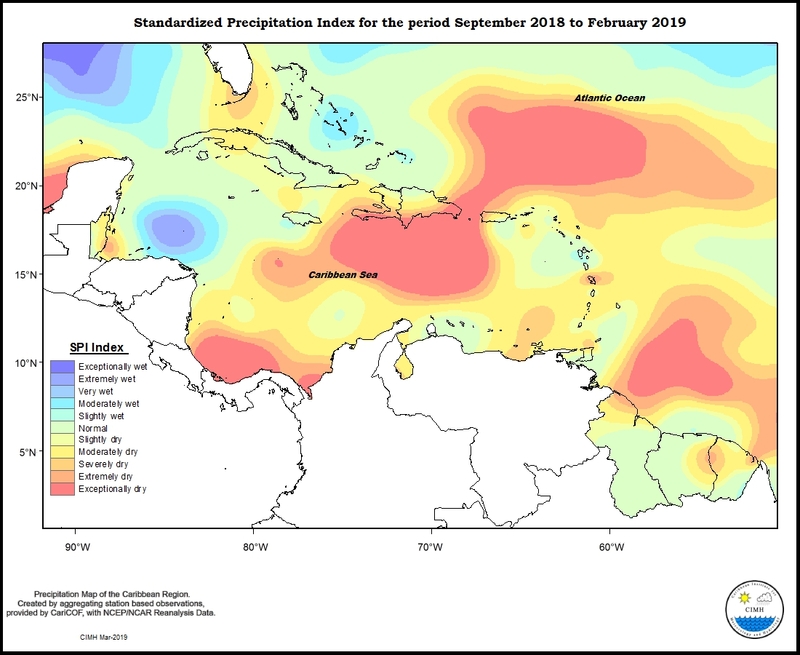 Conditions in the Guianas ranged from exceptionally dry in northern Guyana to slightly wet around the southern Guyana/Suriname border and southeast French Guiana, with otherwise normal to extremely dry conditions in Suriname and French Guiana. 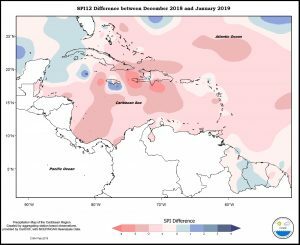 Aruba and Curacao were severely dry. 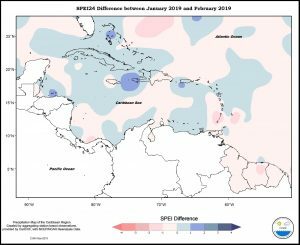 Normal to extremely dry conditions were experienced in Puerto Rico from southeast to northwest, and Hispaniola normal to exceptionally dry from north to south. 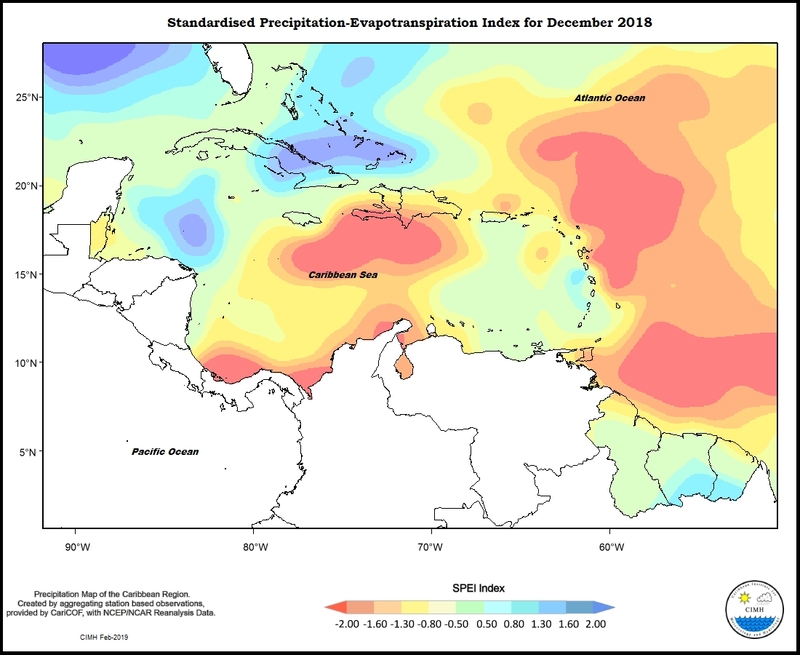 Conditions in Jamaica ranged from moderately wet in the south to slightly dry in the extreme northeast, while Grand Cayman was moderately wet. 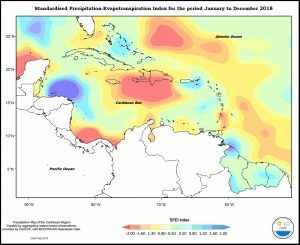 Western Cuba was normal to moderately wet, while the east was normal to moderately dry. 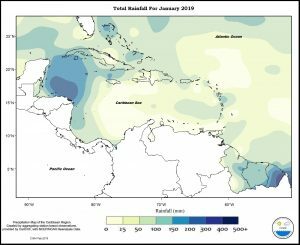 Northern Bahamas was slight to very wet. 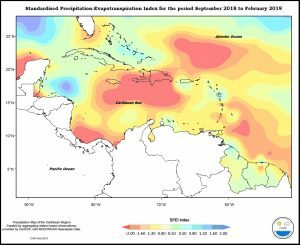 Conditions in Belize ranged from normal in the north to extremely dry from central to southeastern areas. 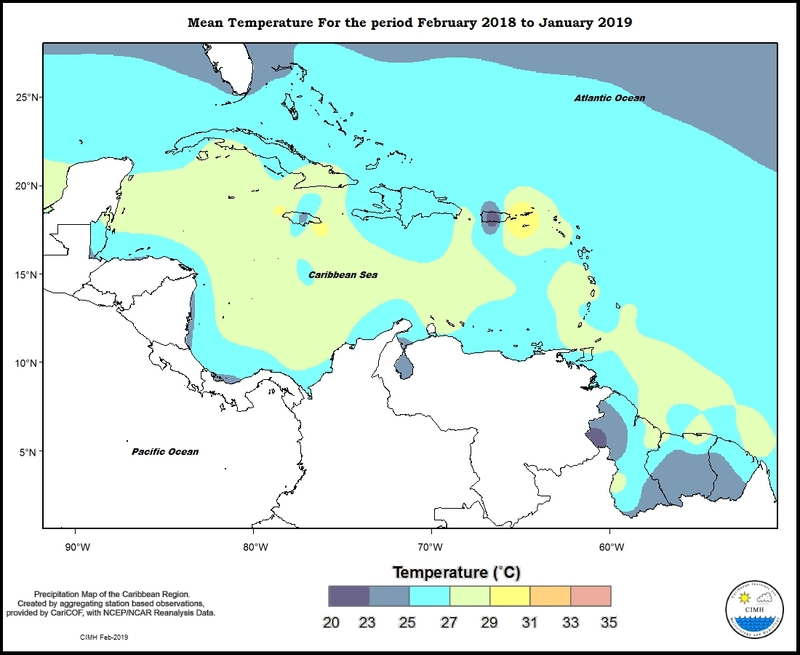 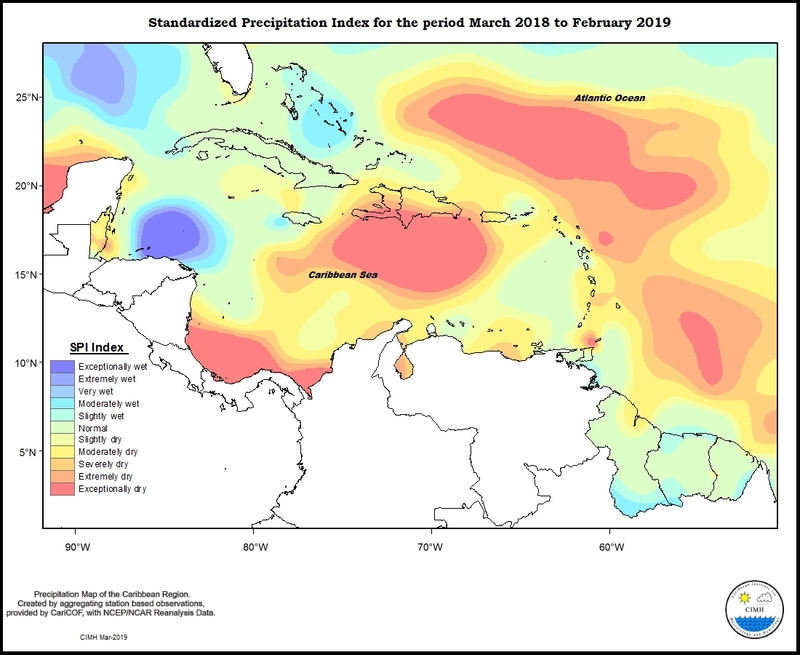 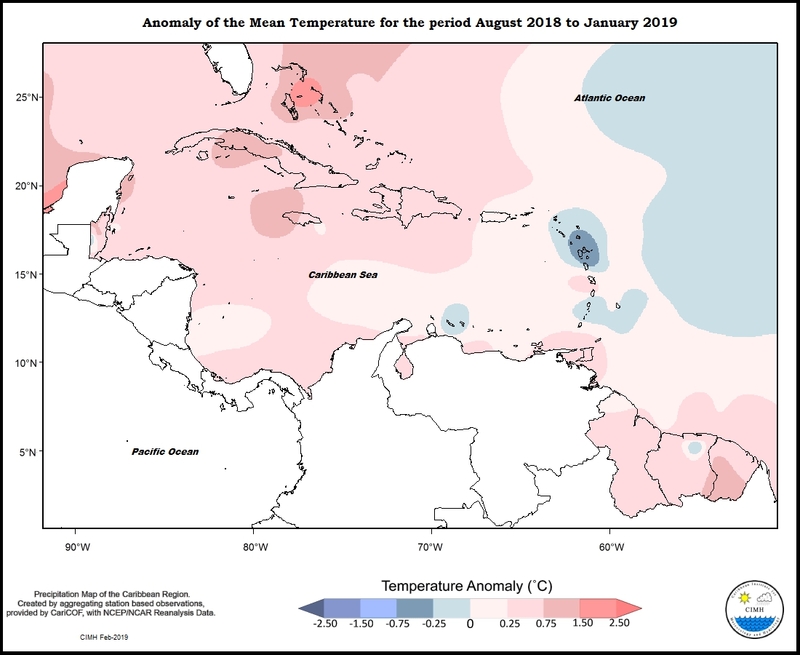 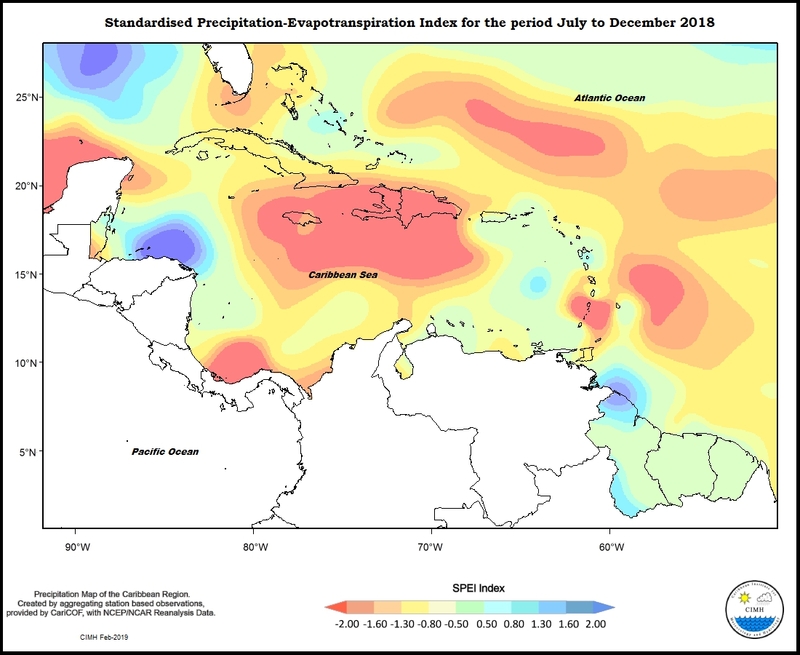 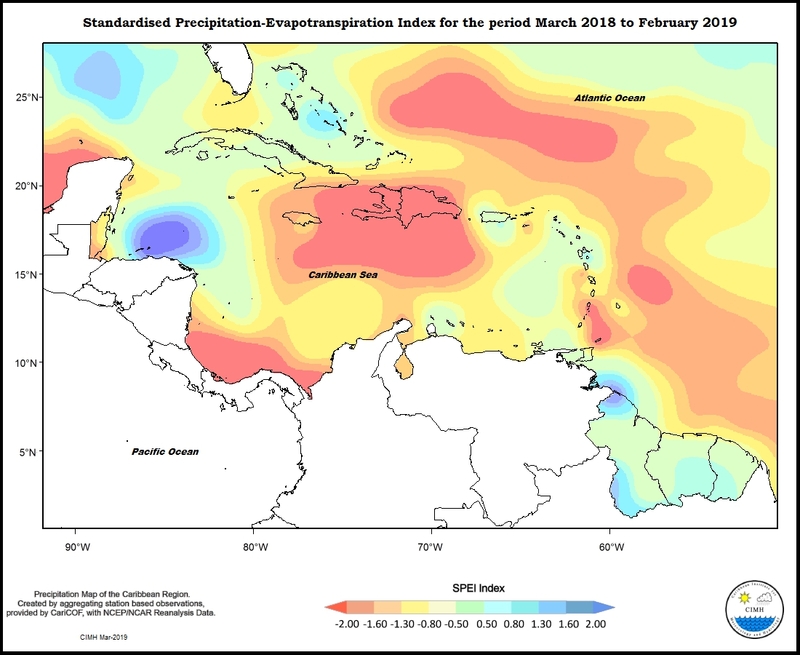 Apart from Guadeloupe that was slightly dry to slightly wet, rainfall totals in the islands of the eastern Caribbean were normal to below normal for the six month period. Trinidad was normal to severely dry from south to north; Tobago and Dominica normal to moderately; Grenada, St. Maarten and St. Thomas slightly dry; Barbados, St. Lucia, and Antigua slight to moderately dry; St. Vincent and St. Croix moderately dry; Martinique severe to extremely dry; and St. Kitts normal to slightly dry. 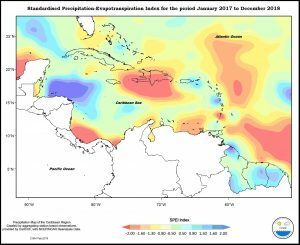 Though most of the Guianas had normal rainfall, portions of Guyana, Suriname and French Guiana ranged from slight to extremely dry. 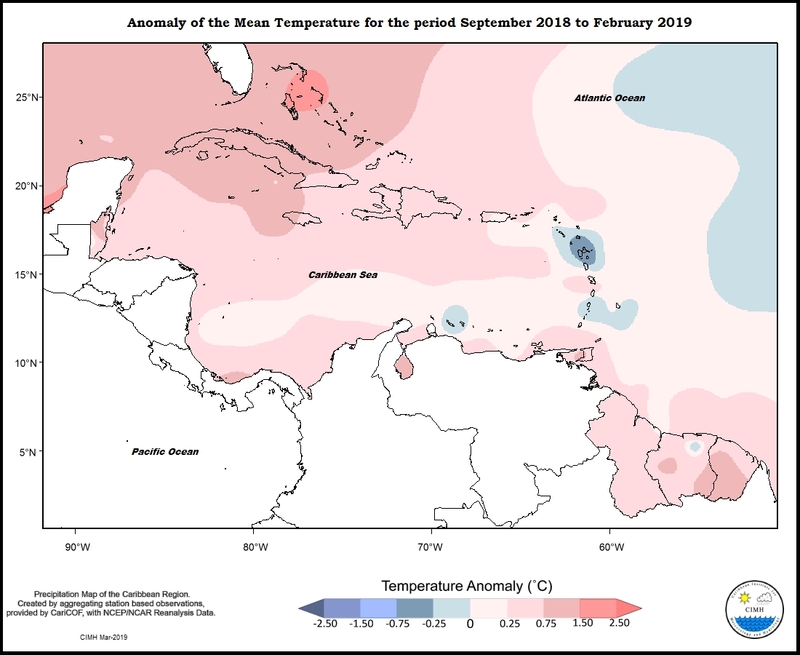 Aruba was slightly dry, but Curacao normal. 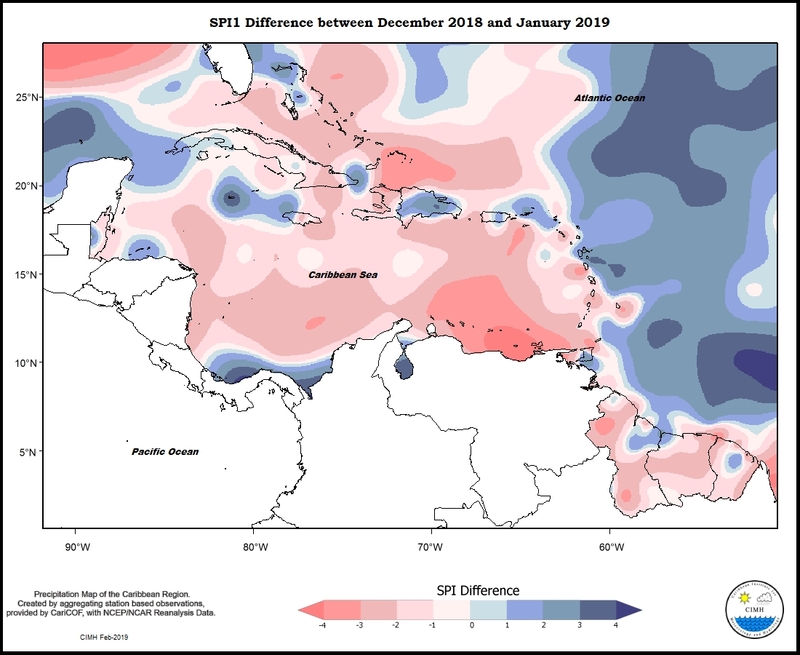 Conditions in Puerto Rico ranged from extremely dry in the west to normal in the southeast, but Hispaniola ranged from normal to exceptionally dry from north to south. 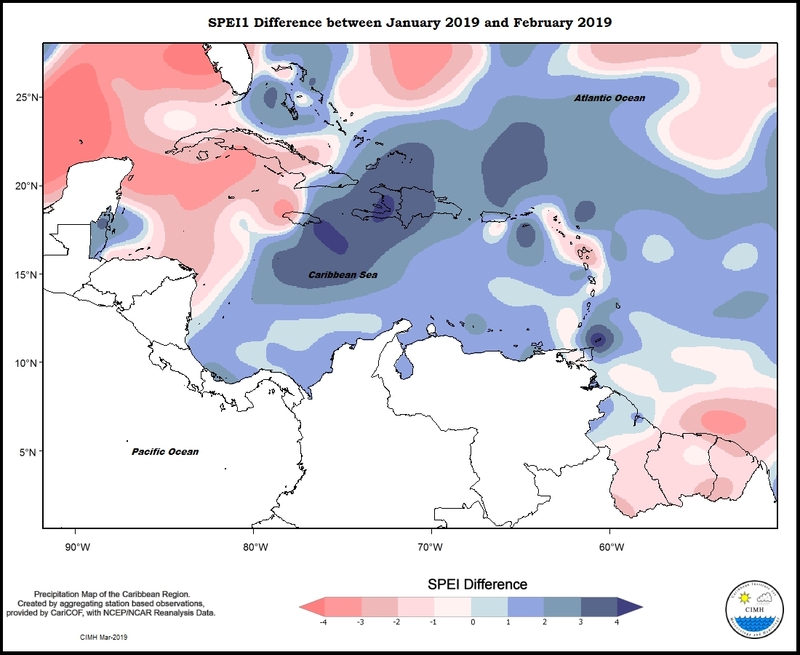 Though Jamaica was predominantly normal, the extreme east and northwest was slight to moderately dry and the extreme southwest slightly wet, and Grand Cayman was normal. 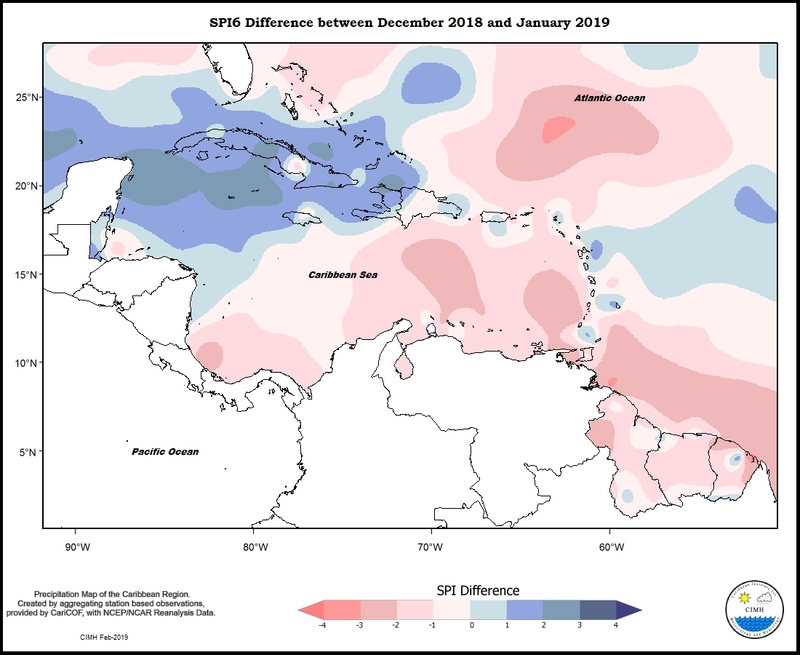 Cuba was normal to moderately dry, while the northern Bahamas was predominantly normal. 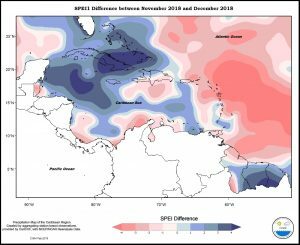 Conditions in Belize ranged from normal in the west and south to extremely dry in the southeast. The twelve month period was dominated by normal to below normal rainfall in the islands of the eastern Caribbean. 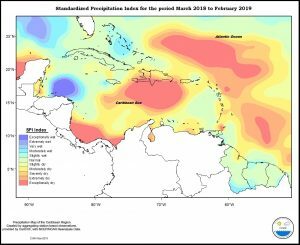 Trinidad was normal to extremely dry; Tobago slight to exceptionally dry; Grenada slightly dry; Barbados, Martinique, Antigua, St. Maarten and St. Croix moderately dry; St. Vincent and St. Lucia moderate to severely dry; Dominica and Guadeloupe normal to severely dry; St. Kitts slight to moderately dry; and St. Thomas normal. The majority of the Guianas were normal, but with moderately dry to moderately wet conditions in Guyana, and from slightly dry at the central Suriname/French Guiana border to moderately wet in the two countries. 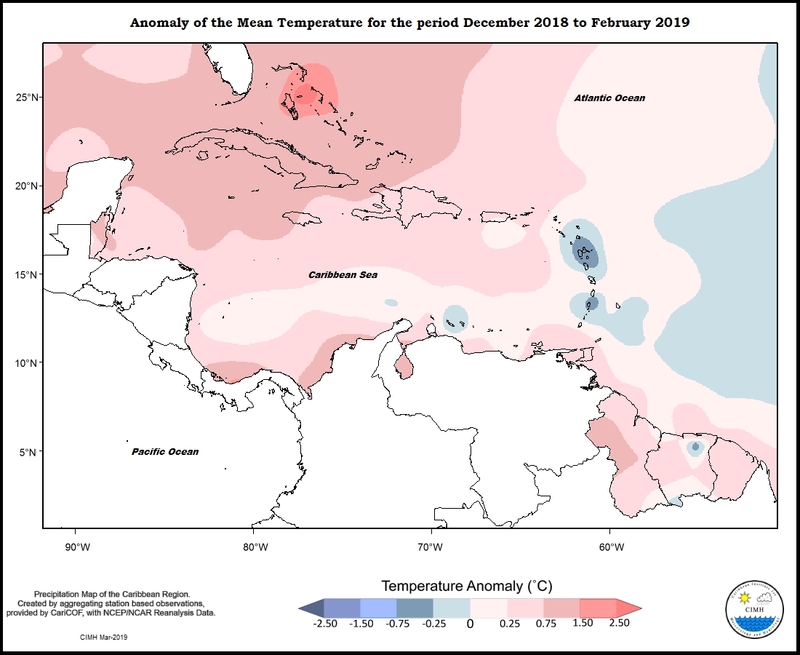 Aruba was moderately dry, but Curacao normal. 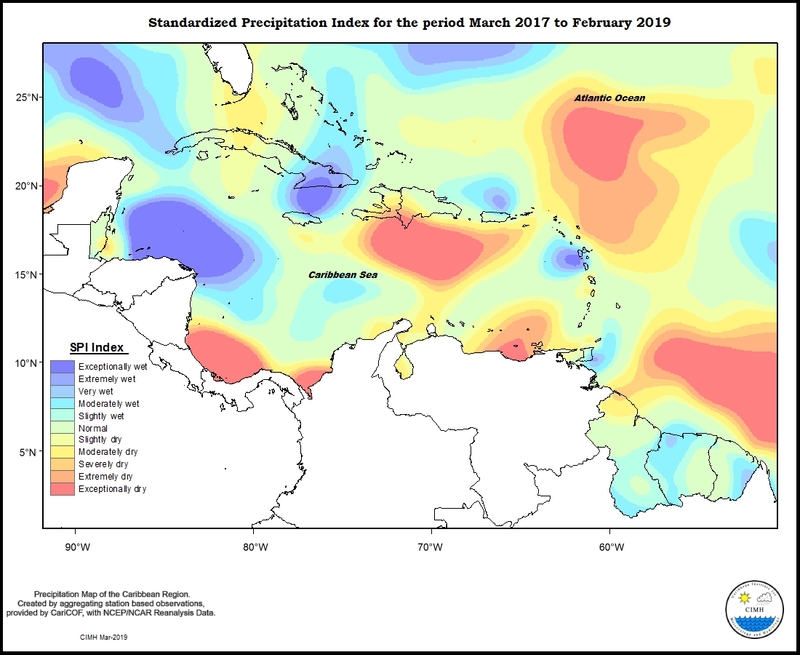 Puerto ranged from severely dry in the west to slightly dry in the east, but Hispaniola was slight to exceptionally dry from north to south. 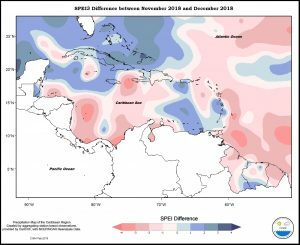 Jamaica was predominantly normal, except for the extreme west that was slightly wet, the extreme northwest and east that were slight to moderately dry. 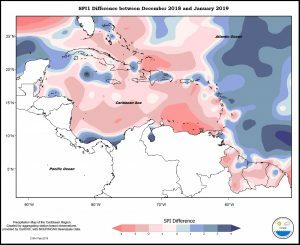 Grand Cayman was slightly dry. 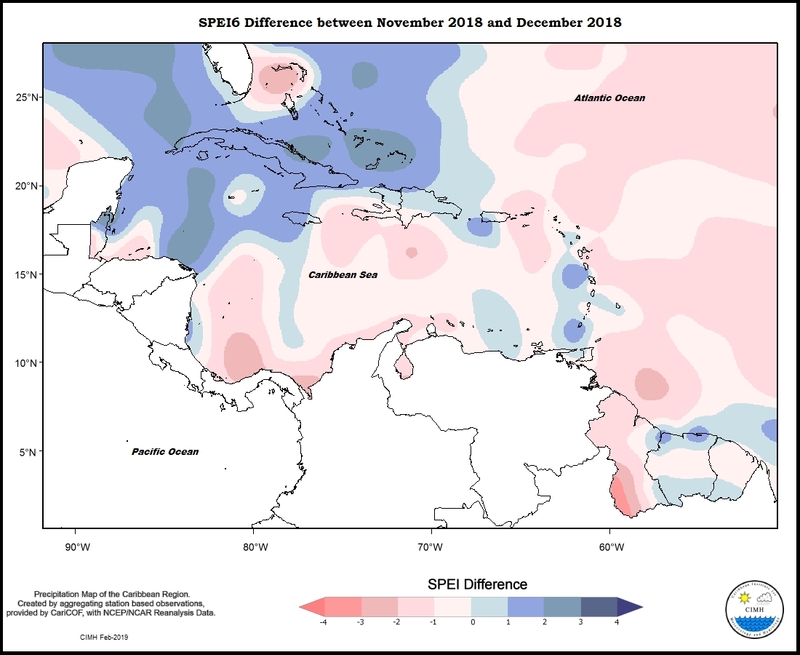 Cuba was normal apart from in the west that was slightly wet, and northern Bahamas was normal to slightly wet. 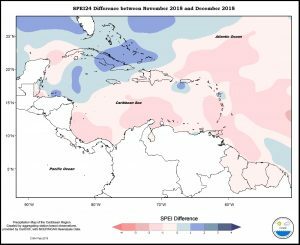 Conditions in Belize ranged from normal in the south to extremely dry in the southeast. 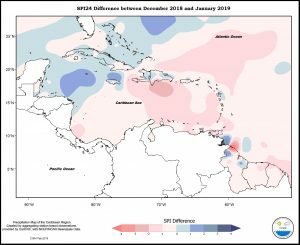 Apart from the northwest parts of the basin and small areas in the southern Guianas, the Caribbean would have experienced normal to below normal rainfall. 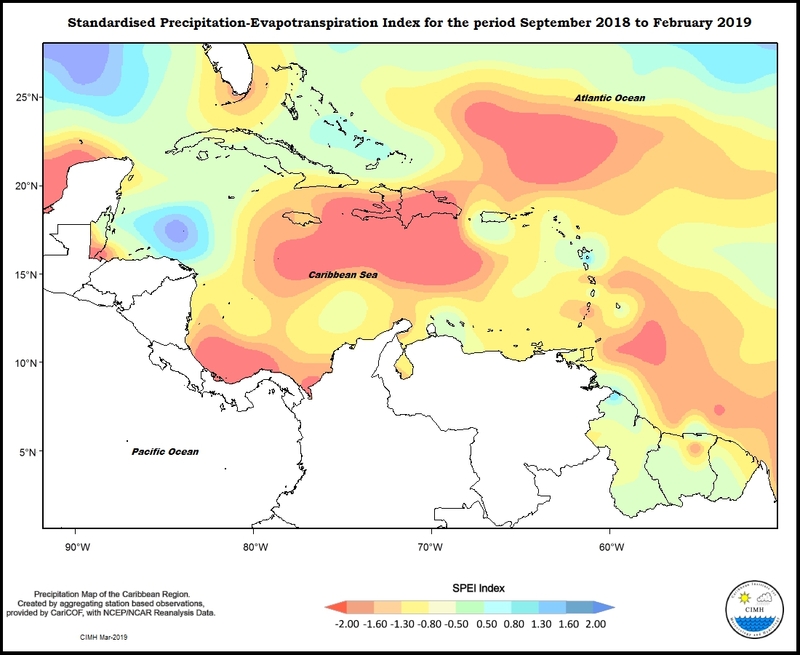 Trinidad ranged from normal in the southwest to exceptionally dry in the northeast; Tobago moderate to exceptionally dry from east to west; Grenada slightly dry; Barbados severe to exceptionally dry; St. Vincent severely dry; St. Lucia moderate to severely dry; Martinique and St. Kitts moderately dry; Dominica normal to severely dry; Antigua and slight to moderately dry; Guadeloupe, St. Maarten, Anguilla and St. Thomas normal; and St. Croix severe to extremely dry. 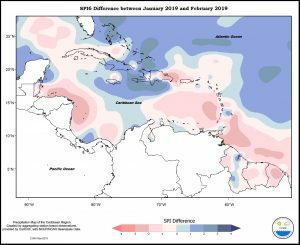 The Guianas ranged from exceptionally dry in northern Guyana to slightly wet in southern Guyana/Suriname border and southeastern French Guiana, with northern French Guiana slight to moderately dry. 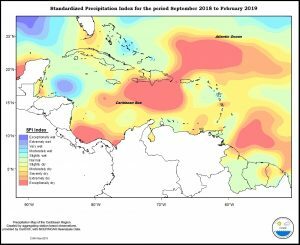 Both Aruba and Curacao were exceptionally dry. 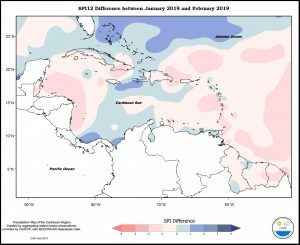 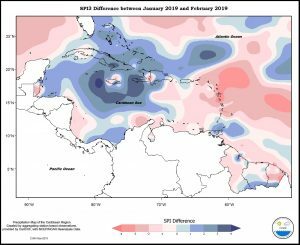 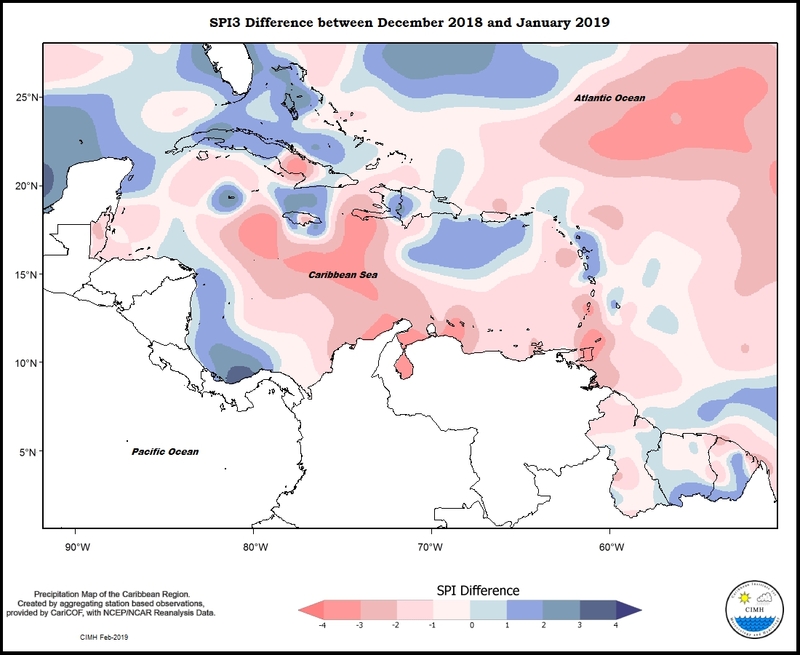 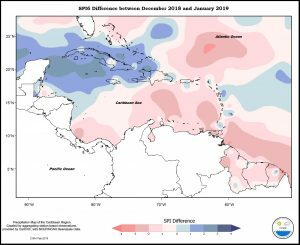 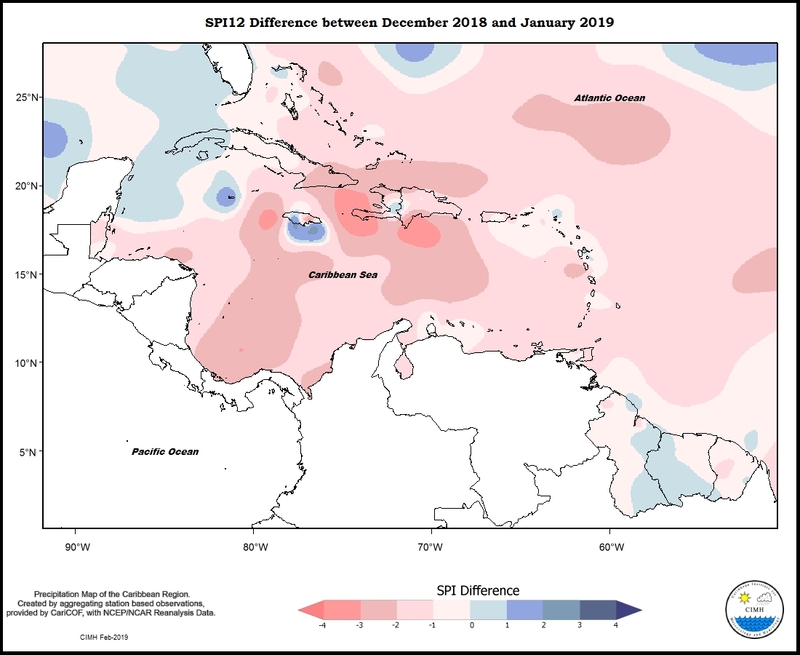 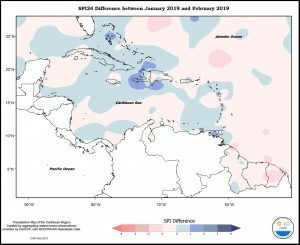 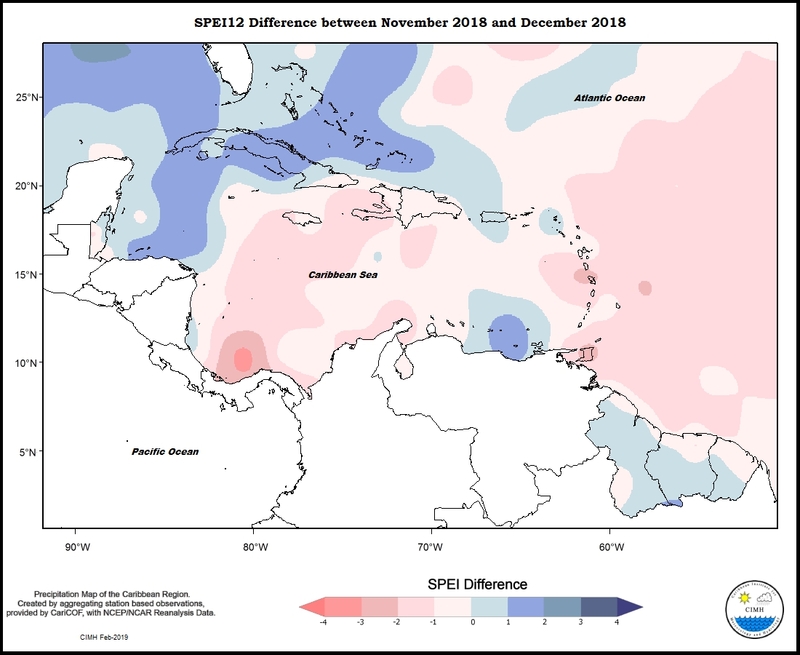 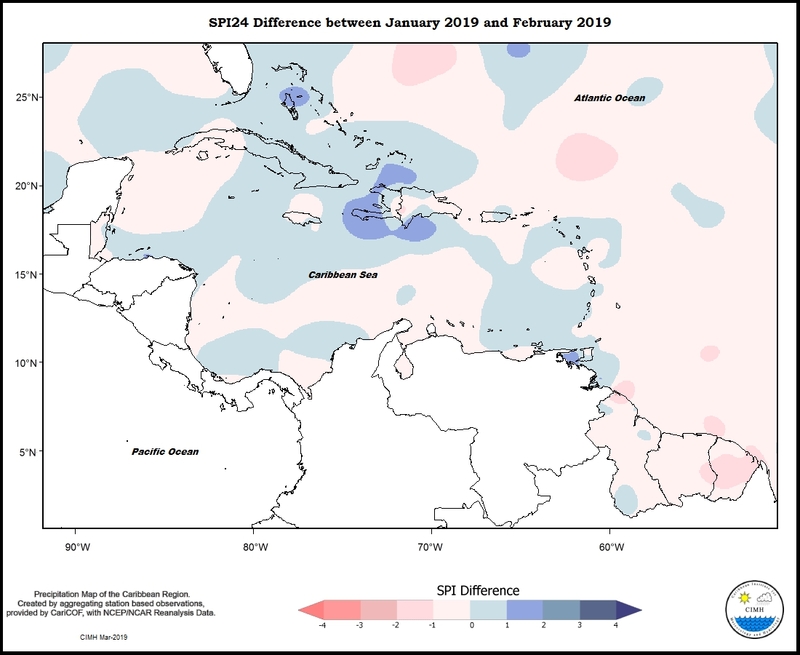 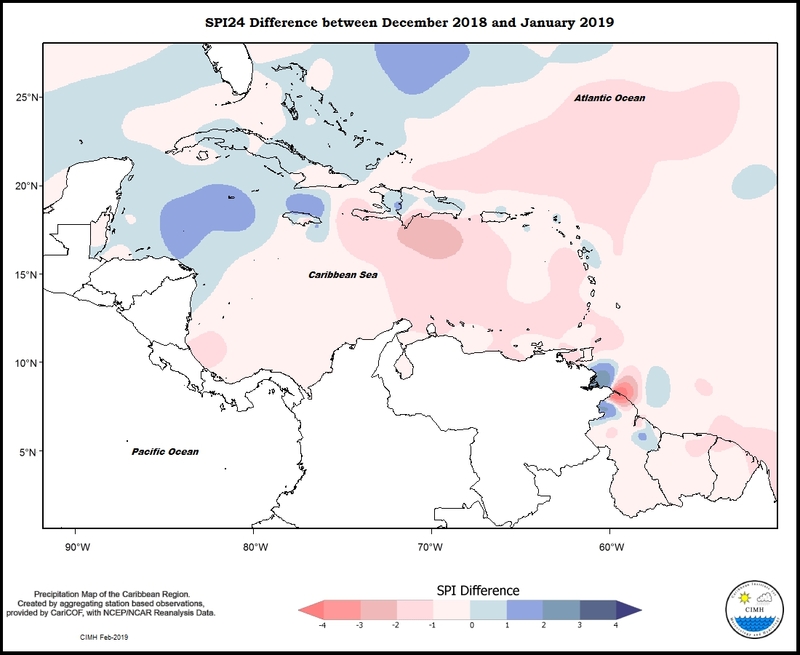 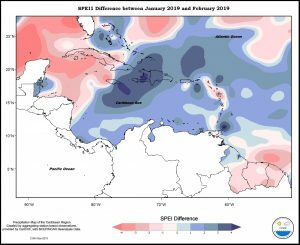 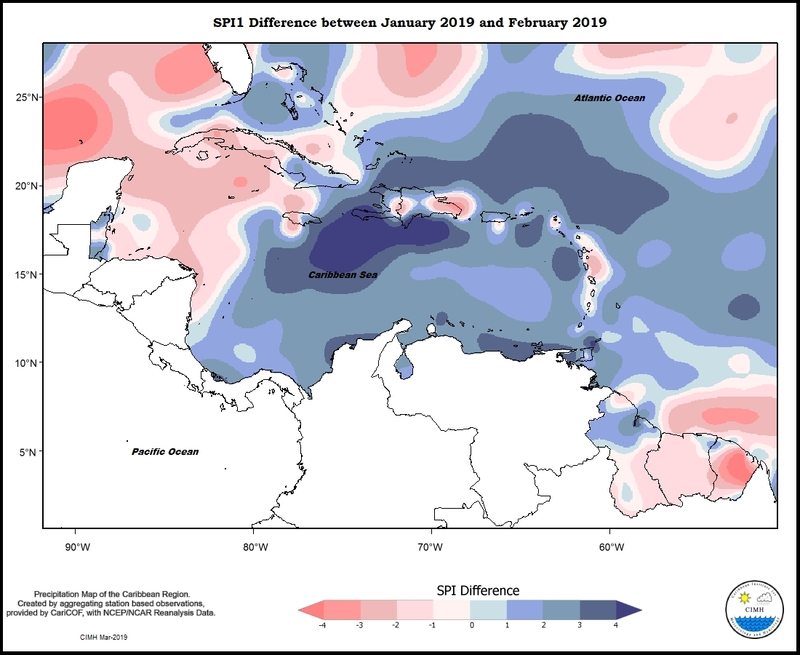 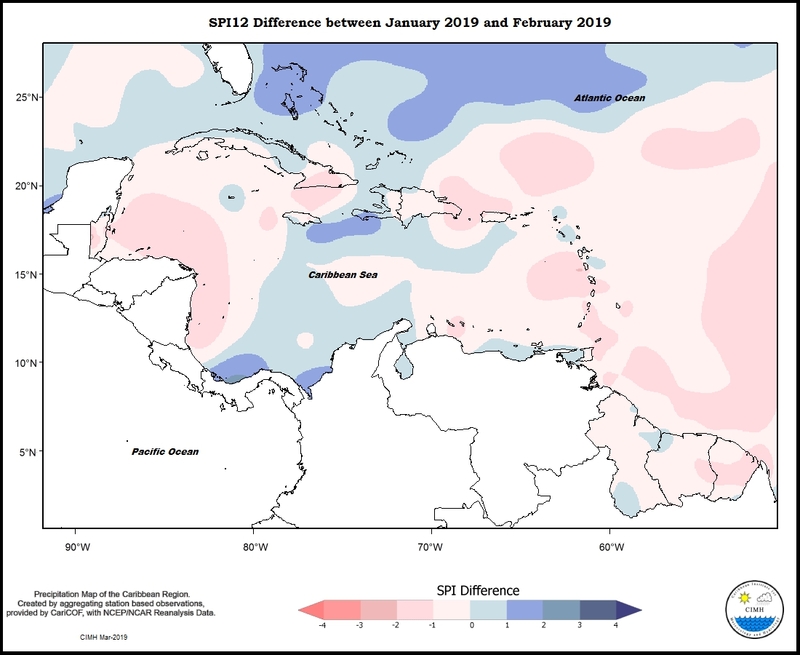 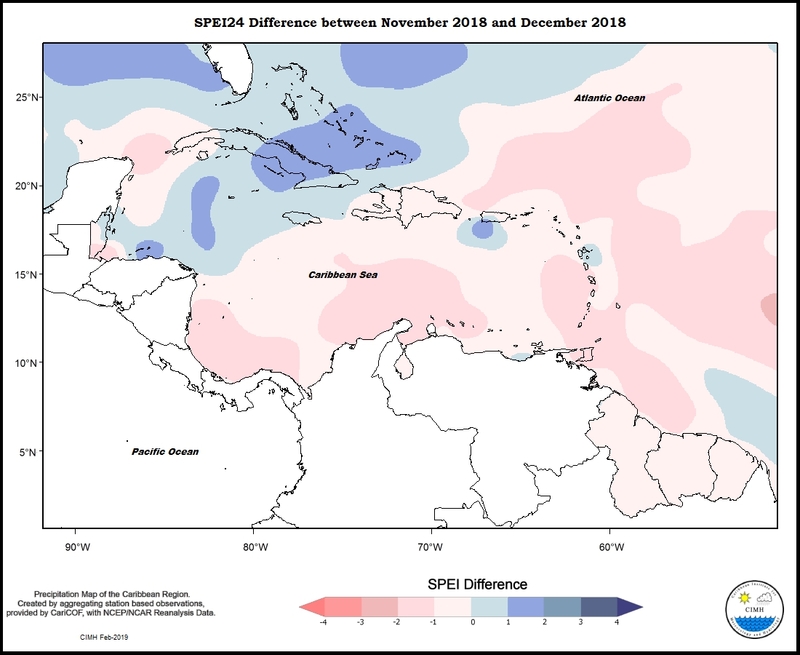 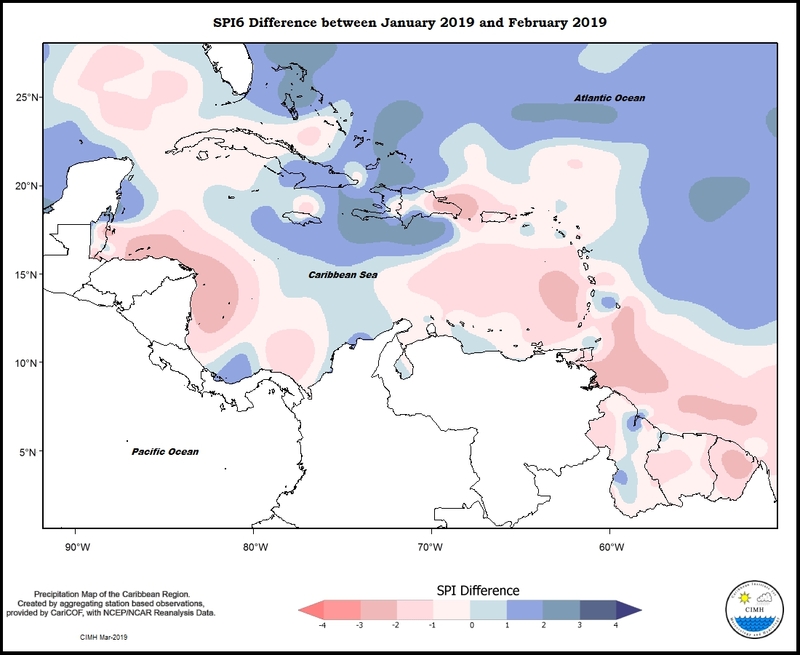 Puerto Rico was normal to moderately dry from south to north, while Hispaniola was predominantly normal, but with the southwest Haiti being slight to severely dry, and portions of eastern Dominican Republic being slightly wet. 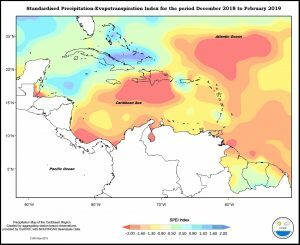 Jamaica ranged from moderately wet in the west to moderately dry in the east, while Grand Cayman was extremely wet. 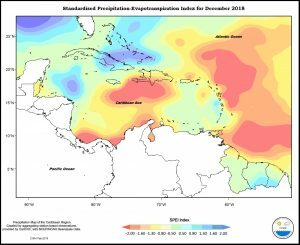 Conditions in Cuba ranged from normal in the east to moderately wet in western areas; while northern Bahamas slight to very wet. 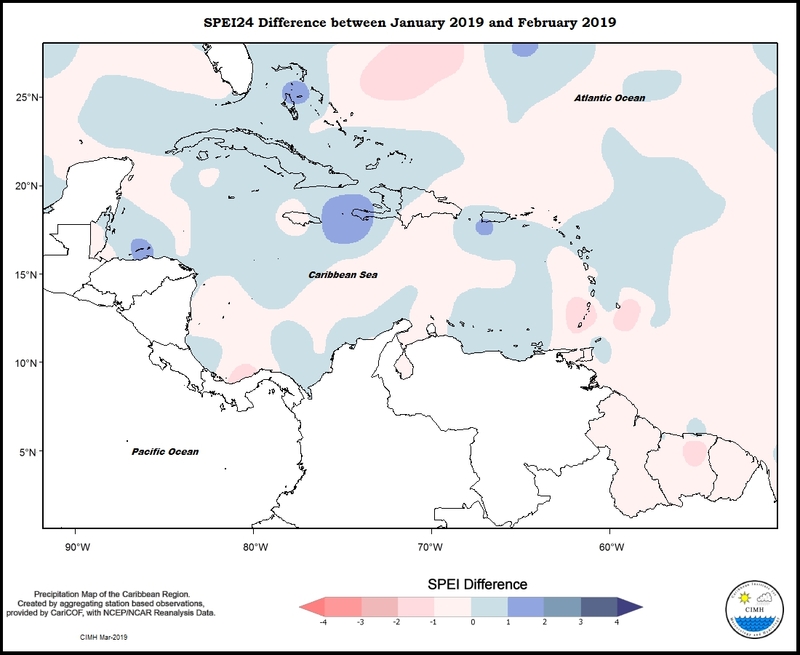 Belize ranged from moderately dry in the south to normal in the north. 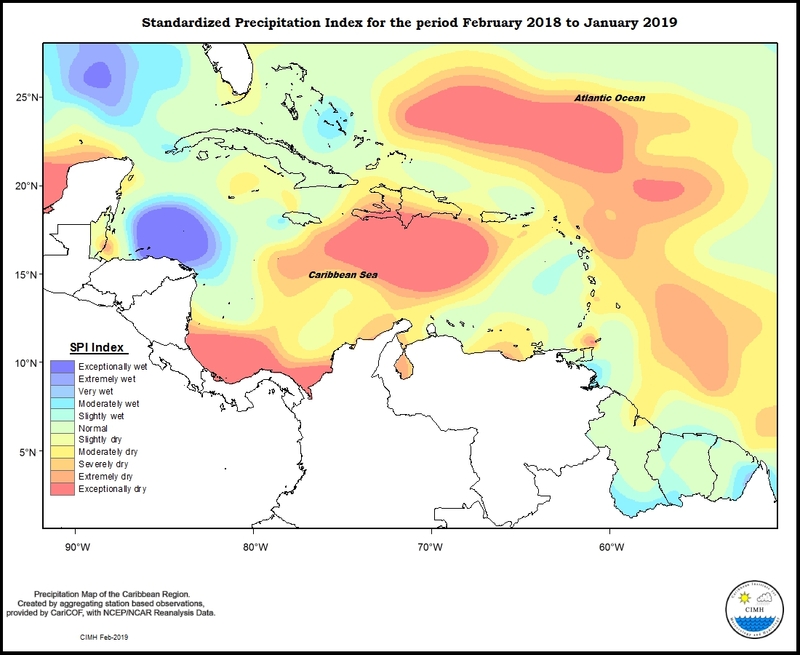 For the three month period, apart from Guadeloupe that ranged from normal to very wet and Dominica from slight to moderately wet, the islands of the eastern Caribbean experienced normal to below normal rainfall. 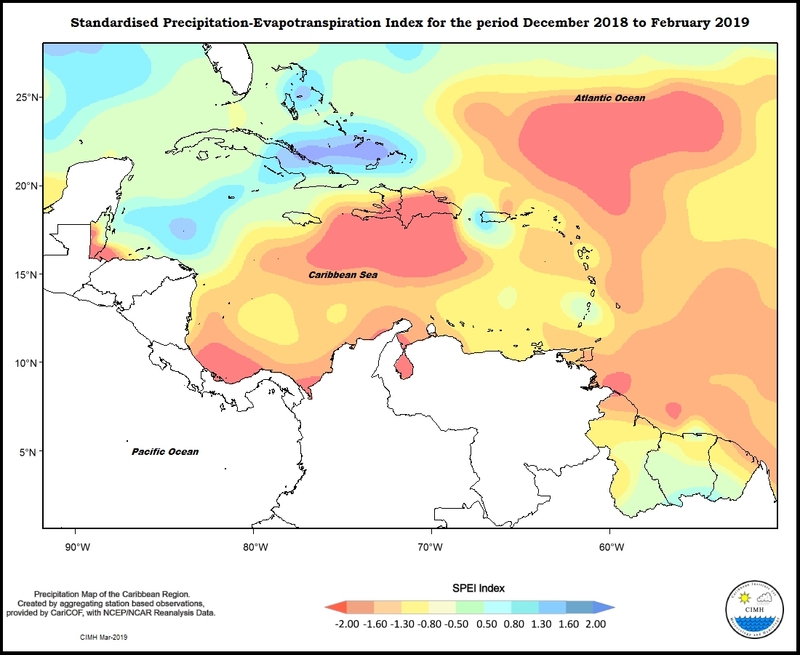 Trinidad was moderately dry in the south to exceptionally dry in the north; Tobago extreme to exceptionally dry; Grenada slightly dry; Barbados slight to severely dry from northwest to southeast; St. Vincent moderate to extremely dry; St. Lucia, Antigua, St. Maarten and St. Thomas normal; Martinique normal to moderately dry; and St. Kitts and St. Croix normal to slightly dry. 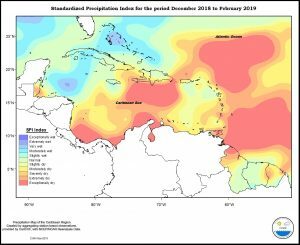 Conditions in the Guianas ranged from exceptionally dry in northern Guyana to exceptionally wet in southeastern parts of French Guiana. 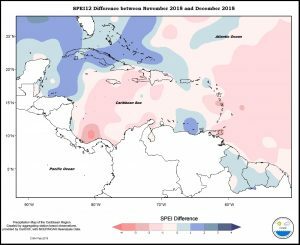 Aruba was moderately dry and Curacao severely dry. 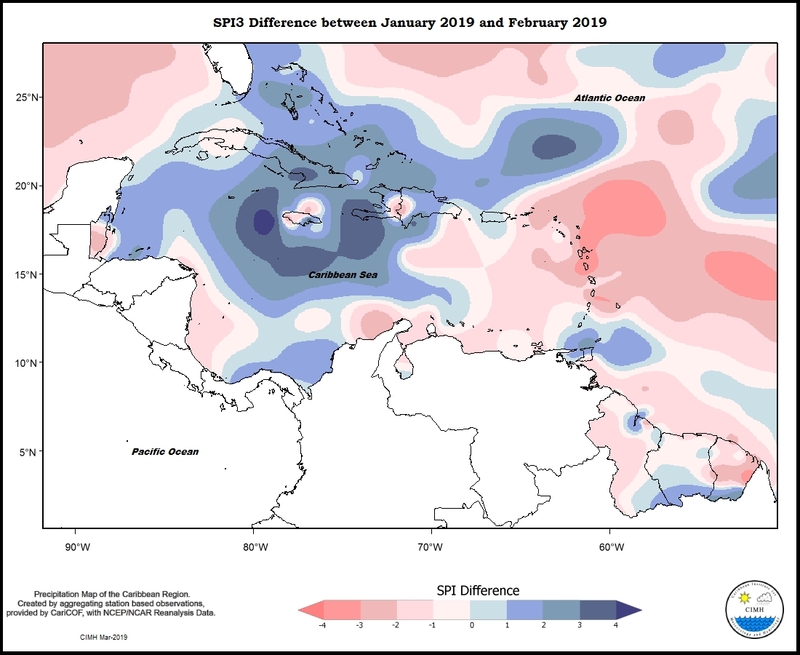 Conditions in Puerto Rico ranged from severely dry in the northwest to normal in the southeast, but Hispaniola ranged from exceptionally dry in southwest Haiti to extremely dry in eastern Dominican republic. 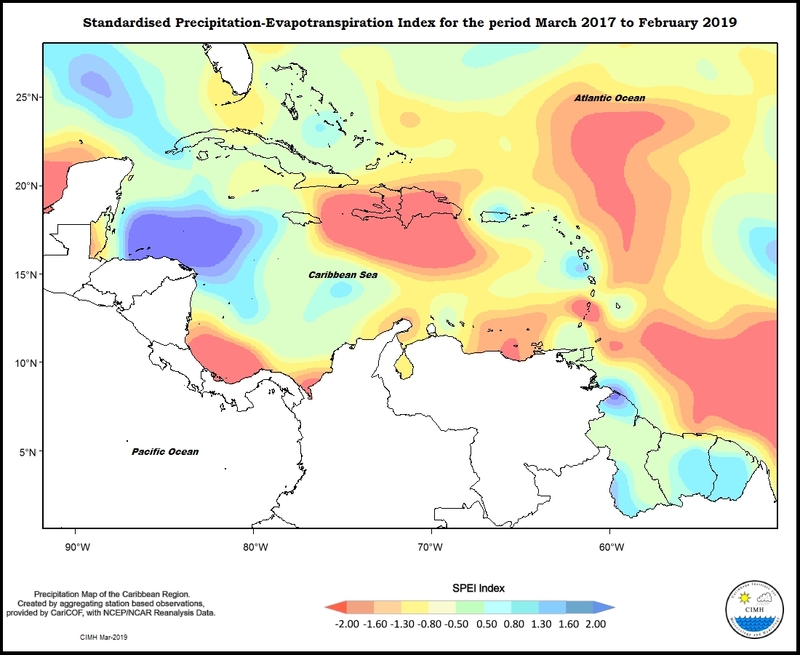 Jamaica was moderately wet in the west to moderately dry in the east, while Grand Cayman was normal. 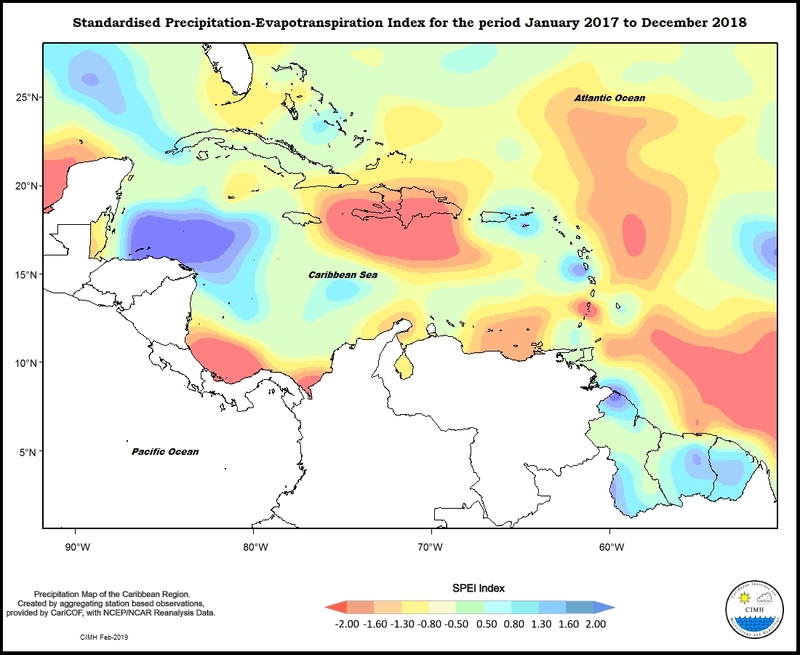 Western Cuba was normal to moderately wet and the east was slight to extremely dry; but northern Bahamas was normal to slightly wet. 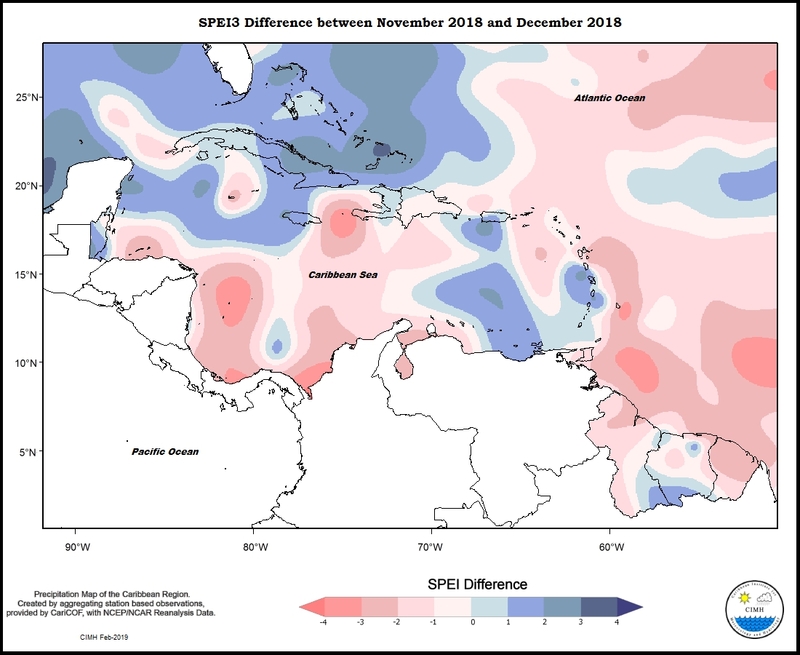 Belize ranged from normal in the north to moderately dry in the southeast. 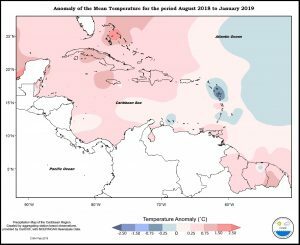 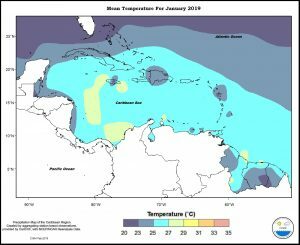 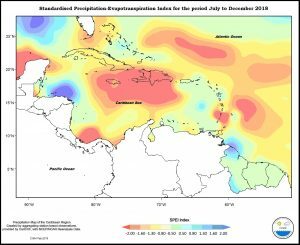 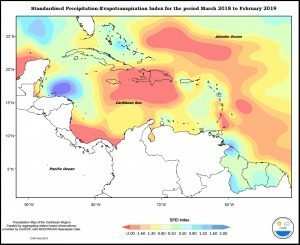 Though some parts of the eastern Caribbean experienced above normal rainfall for the six month period, rainfall in the sub-region was predominantly normal to below normal. 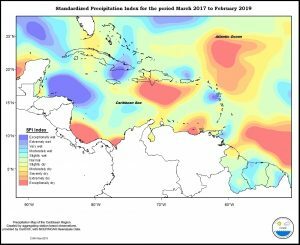 Trinidad ranged from moderately wet in the south to severely dry in the northeast; Tobago and Barbados normal to moderately dry; Grenada and St. Thomas normal; St. Vincent and St. Croix moderately dry; St. Lucia slight to moderately dry; Martinique moderate to extremely dry; Dominica and Guadeloupe slightly wet to slightly dry; Antigua, St. Kitts, Anguilla and St. marten normal to slightly dry. 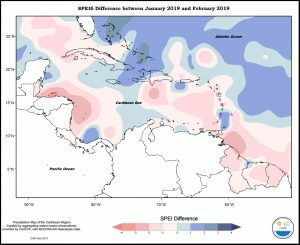 In the Guianas, Guyana ranged from severely dry in the north to slightly wet in the south, with normal to moderately dry in Suriname and moderately wet to severely dry in French Guiana. 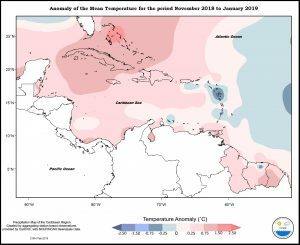 Aruba was slightly dry but Curacao normal. 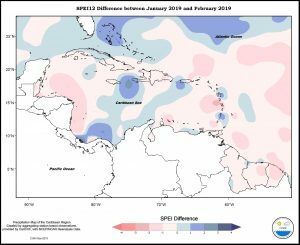 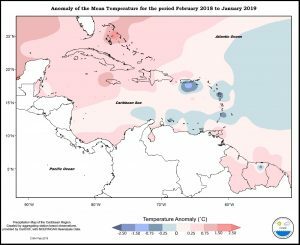 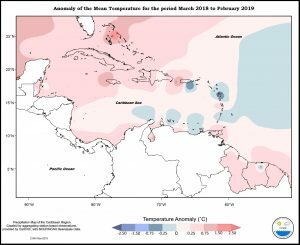 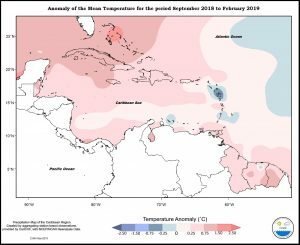 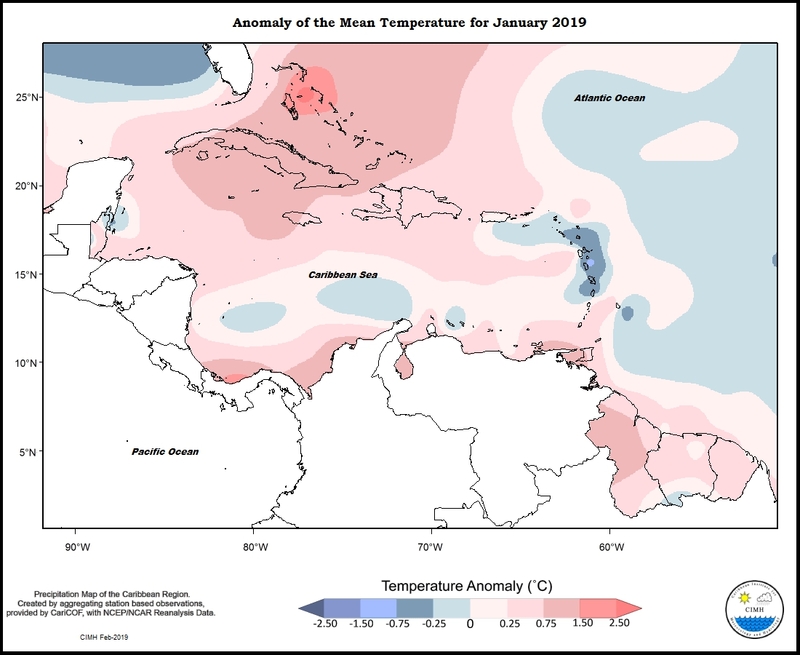 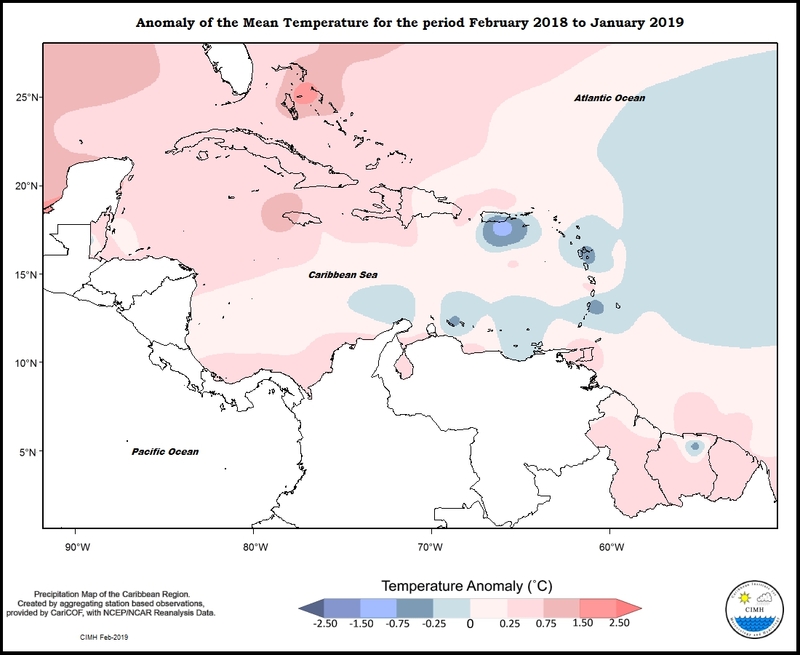 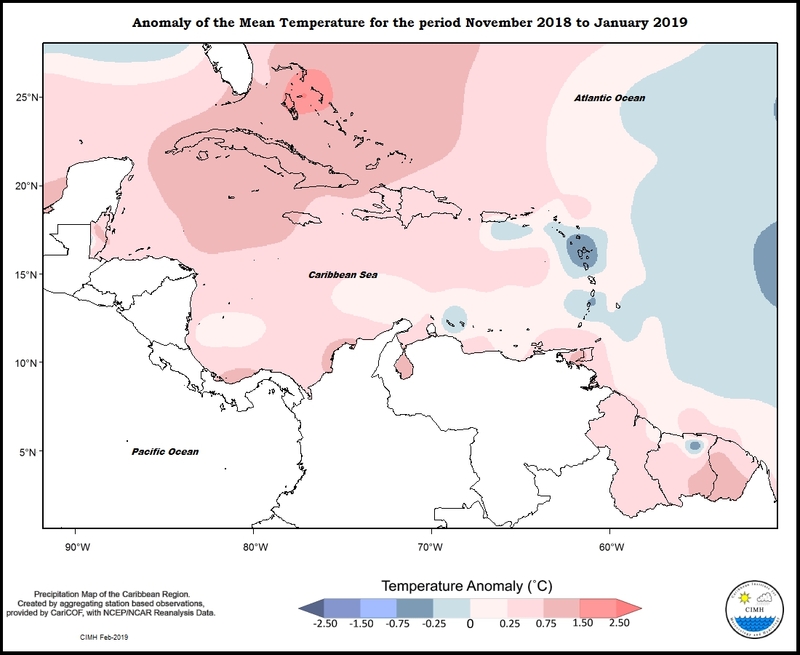 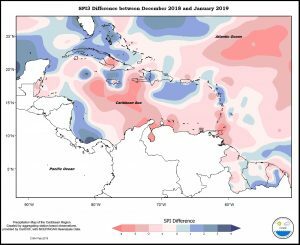 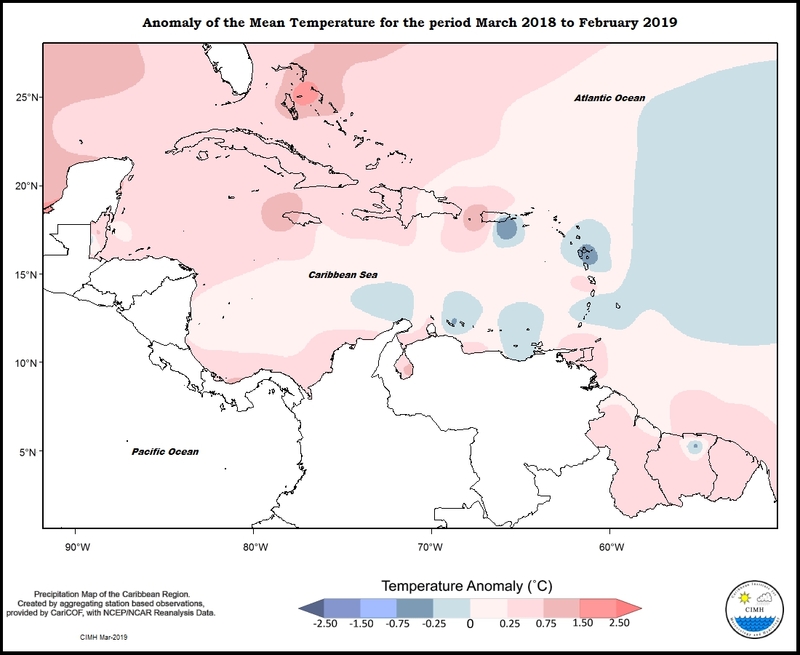 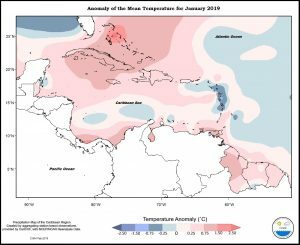 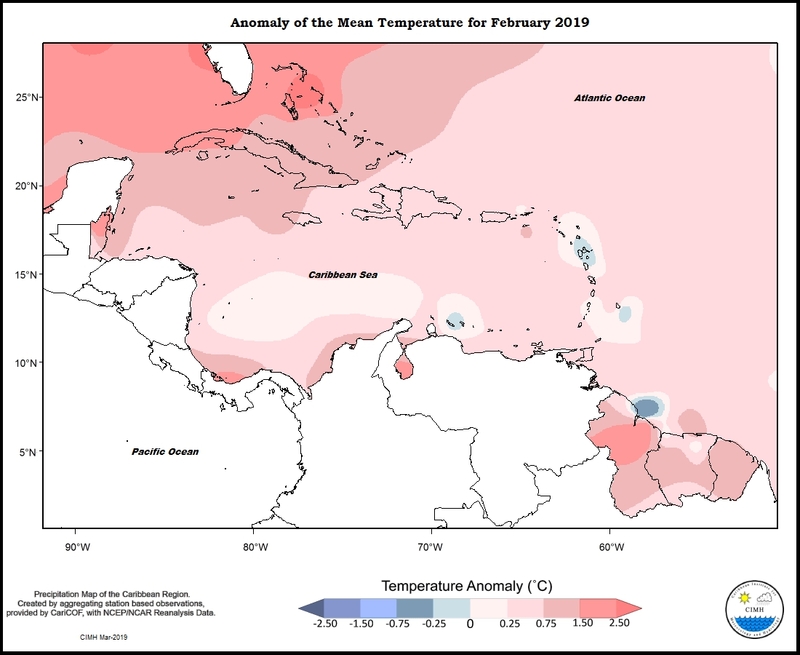 Conditions in Puerto Rico ranged from moderately dry in the west to normal in the south east, while Hispaniola ranged from exceptionally dry in southern Haiti to slightly dry in northeastern Dominican Republic. 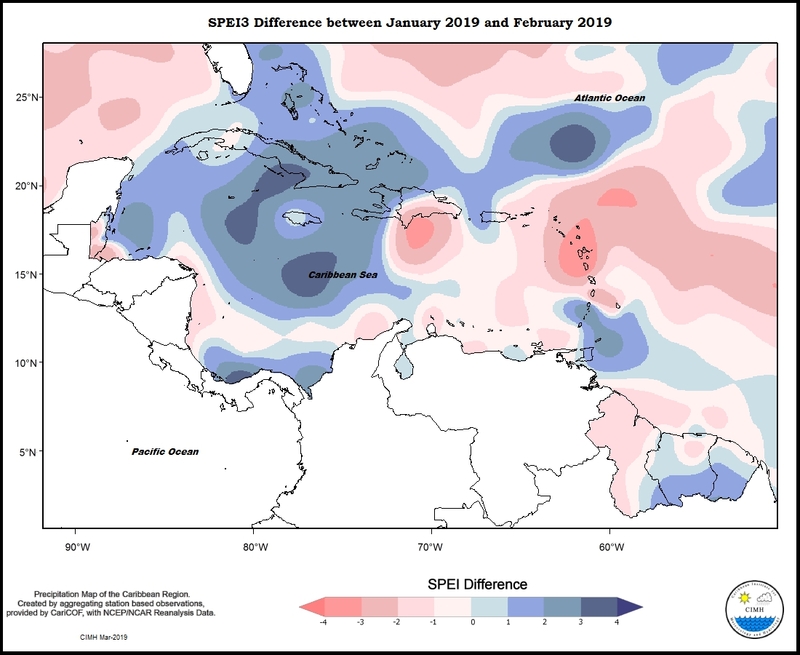 Jamaica was predominantly normal except for northwestern areas that were slight to moderately dry and eastern areas that were slight to severely dry, but Grand Cayman was normal. 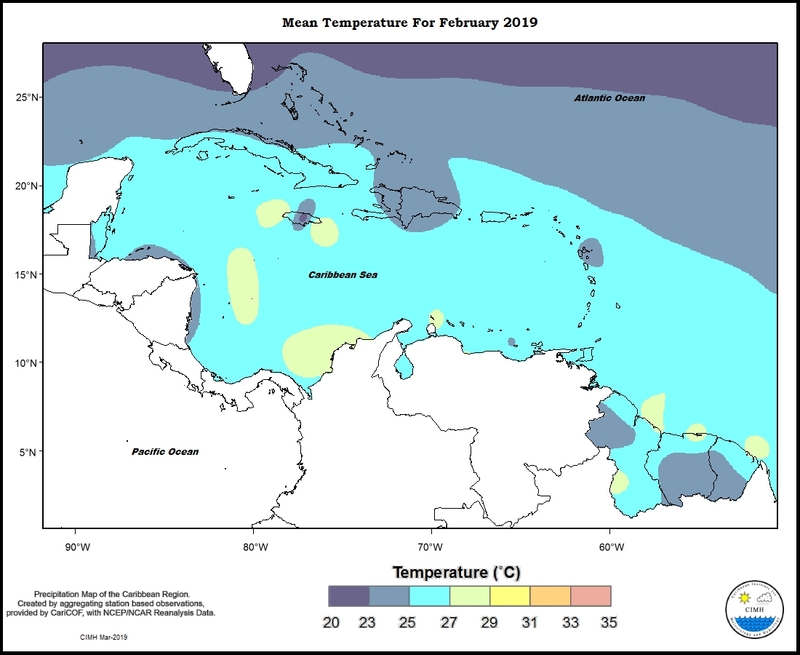 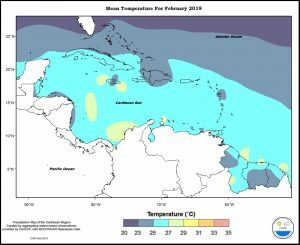 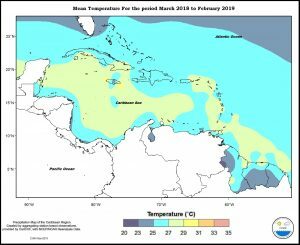 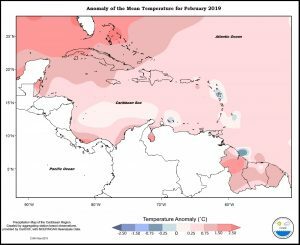 Conditions in Cuba ranged from moderately dry in central areas to slightly wet in the west and to normal in the east, but northern Bahamas was moderate to slightly dry from west to east. 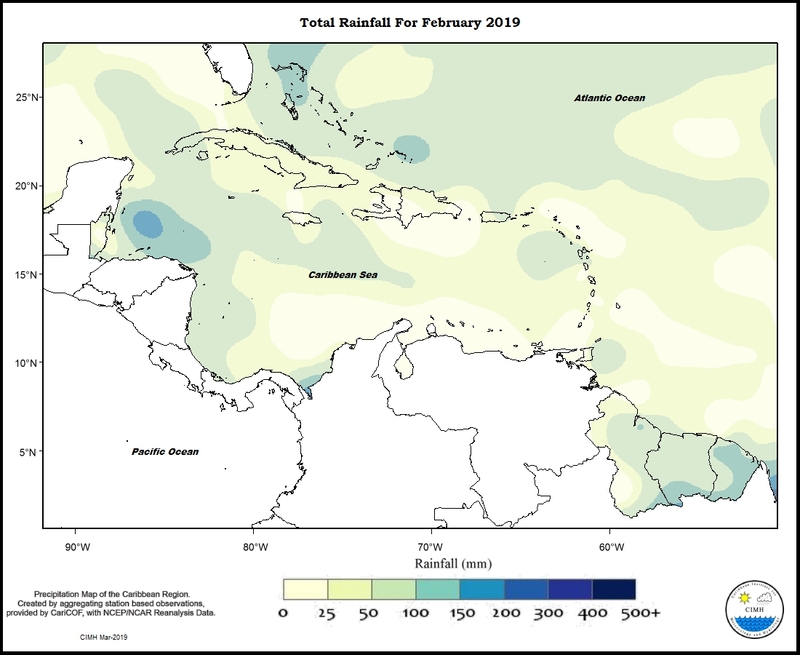 Belize ranged from moderately wet in the south to extremely dry in the southeast and to normal to the north. Apart from Trinidad that ranged from slightly wet in the south moderately dry in the north, the islands of the eastern Caribbean experienced normal to below normal rainfall totals for the twelve month period. 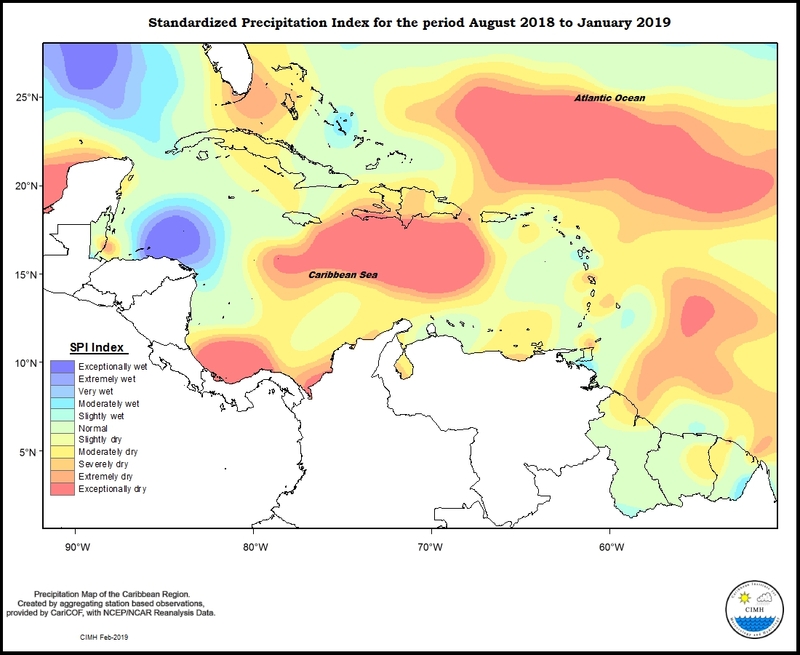 Tobago was normal to extremely dry from east to west; Grenada, Dominica and St. Thomas normal; Barbados, Antigua, St. Maarten and St. Croix moderately dry; St. Vincent, St. Lucia and Martinique slight to moderately dry; Martinique from slightly wet to exceptionally dry; Guadeloupe predominantly normal apart from areas in the extreme east that were slight to moderately dry; and St. Kitts slight to moderately dry. 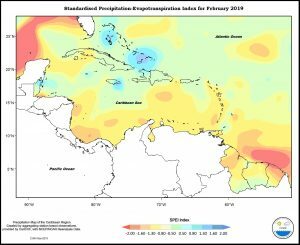 In the Guianas, Guyana ranged from moderately dry in northeastern areas to moderately wet in the south, while Suriname ranged from normal to moderately wet, and French Guiana normal to very wet. 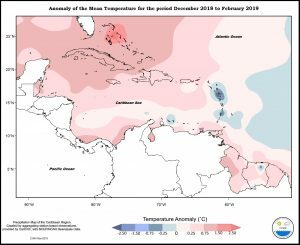 Aruba was slightly dry, but Curacao normal. 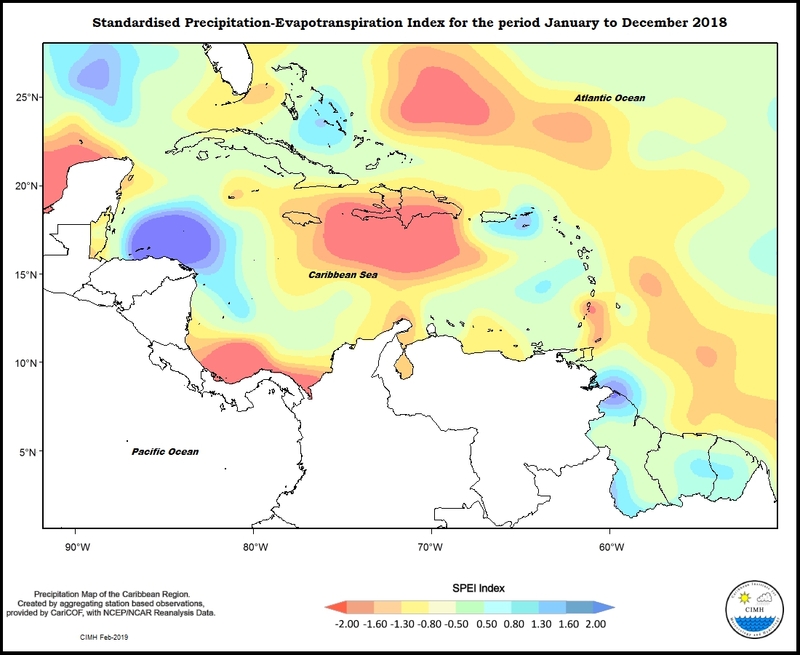 Conditions in Puerto Rico ranged from severely dry in the southwest to normal in the northeast, but Hispaniola from exceptionally dry in the south to slightly dry in the northern Dominican Republic Conditions in Jamaica ranged from slightly wet in the west to moderately dry in the east, but Grand Cayman was slightly dry. 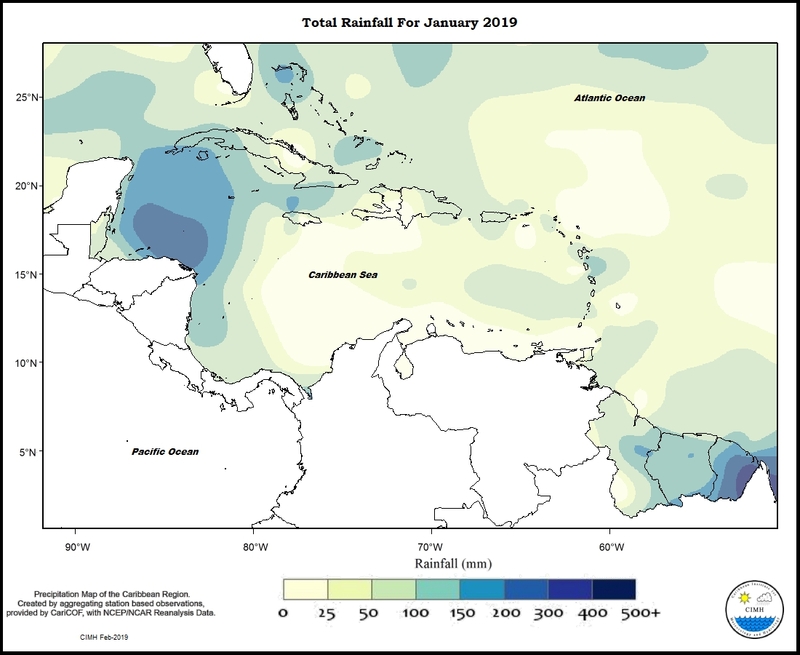 Cuba’s rainfall was predominantly normal, apart from areas in the extreme west that were slight to moderately wet, and in portions of the east that were slight to moderately dry, while northern Bahamas was normal. 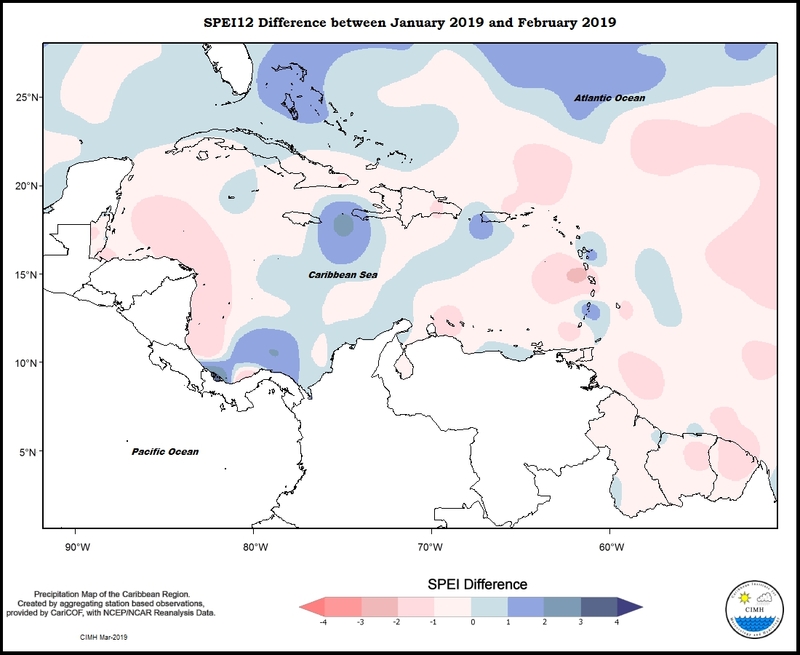 Belize ranged from extremely dry in the southeast to normal in the south and northeast.